Micro IIi Readouts (Model AEQ) feature digital displays, USB and RS-232 serial data outputs for S.P.C. data logging. These air gage readouts incorporate precision ceramic pressure sensors that provide stability from drift not found in competitive instruments. Both single and dual master air gage members can be operated by these versatile instruments. 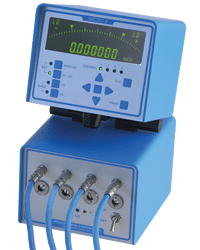 Micro IIi Features include Backlit LCD display; Tolerance indicator lights, total indicator reading (TIR) on single Channel Units, digital preset, USB & RS-232 serial data output and are available in 1, 2 , 3 and 4 channel units. Micro IIi is CE compliant. Single-setting master Micro-IIi and Millicheck are factory calibrated to Western’s Series 60, 70 or 80 air gage specifications. Western’s single-master gaging members, as well as similar members manufactured by Federal Products Corporation, are operated by these instruments. Dual-setting master Micro-IIi and Millicheck instruments have user-accessible span and zero controls. Western’s series 10 gaging members as well as dual-master members made by other manufacturers such as Sheffield, Moore Products and Edmunds, are operated by these instruments. Millicheck features include a high resolution circular LCD display with four decade digital display and selectable ranges. This unit is powered by 4 ‘D’ cell batteries with a minimum life of 3 months. An optional 120 – 250 VAC power adapter is available. Electronic Gaging Cartridges . . . for applications where contact gaging is preferred, the Millicheck instruments can be configured to operate one or two LVDT type electronic gaging cartridges. The factory installed LVDT gaging modules provide “Channel A Only”, “Channel B Only” and “Ch A + Ch B” modes.